Demolition Derby is the renovation catchphrase these days. With demolition in full swing—and moving FAST—it’s hard to believe that just a few weeks ago we were putting on a show. Much has changed since then. If you’ve been following our Facebook or Instagram pages, you’ve probably seen pictures of the Green Room, dressing rooms, and Mainstage. Over the past two weeks, they’ve transformed. Two huge dumpsters were brought in and stationed just outside of the loading dock. Much of the first few days consisted of filling them with all of the old chairs. With pulleys and rigging equipment, Jill, Adam and their team lowered speakers and lighting instruments. The booth, as well, was emptied of all sound and light boards, monitors, cables, and spots. 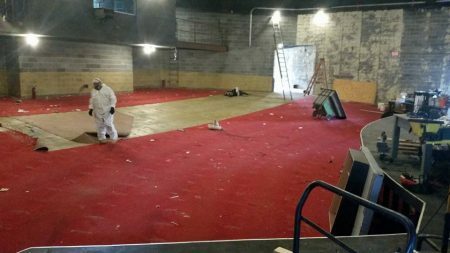 With the chairs gone, construction workers built false doors to block off the entrances to the Mainstage from the lobby and began tearing up the carpet. It soon became a “Hard Hat Only” zone. Meanwhile, in the Green Room and dressing rooms, staff cleaned out everything from props, to kitchen utensils and mugs, costume racks, wigs, makeup, and fabric. As much as could be saved was saved, and the rest donated or thrown away. Even the washer, dryer, and refrigerator were moved! ACT’s lobby is packed full of items to be donated or sold. Construction workers took over and walls came down. All interior walls of the wig room were torn apart to make a larger dressing room. 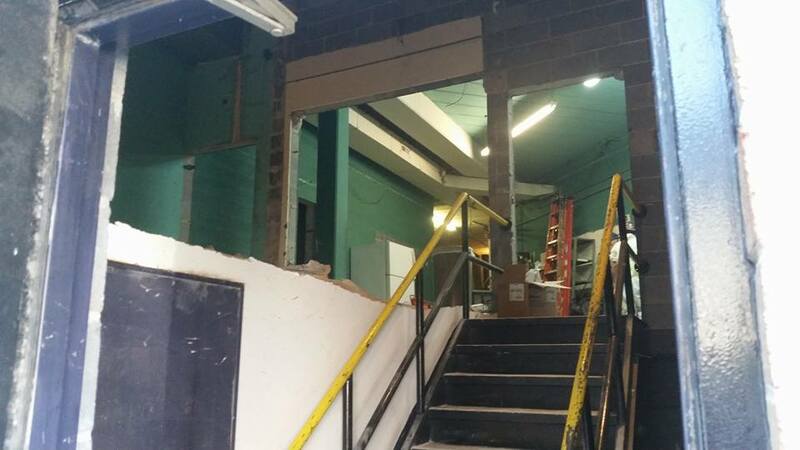 Bathroom walls were demolished too, and toilets, mirrors and kitchen cabinets removed. Everyday something is changing. If you blink, you’ll miss it. We can’t wait to find out what will happen this week! Want to find out with us? Check out our Facebook and Instagram pages.